Installed myself into an Audi A4 Avant with a Symphony II head-unit. It has been a great car, but the CD/Cassette stereo was it's biggest draw-back. Swapping the head-unit would have been expensive and had its downsides. poor match to interior. Difficult to integrate steering wheel controls. 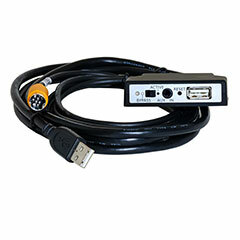 This Dension unit solved the input issues and kept the factory design, functionality and excellent sound. I wanted Aux/iPod input. I was skeptical, but took a chance any bought the GW Pro BT, with Bluetooth. Everything works! Happy with the purchase. Delivery from Enfig, from US to Canada, took only 3 days and I had no customs or delivery issues. Extremely convenient. Installation wasn't completely smooth, but I got through it. My head unit required 4 tools, but I only ordered the 2-pack. I found 2 more locally, for more $. Removing the unit took many tries, but I finally figured it out. I found the instructions somewhat confusing. eg the wiring harness pictured in the booklet was different from mine. and the instructions were common with several makes of cars. The Enfig Youtube videos were very useful, and included a nearly identical situations to mine. I had to replace a tail light to resolve an error message in the instrument panel which blocked the Dension menu. Another message to depress the clutch before starting the car did the same. For a while I thought I could only access the Dension menu with the engine running (and message gone) but eventually discovered the Audi's "reset" button on the wiper arm clears the messages. Who knew? With these issues resolved iPod access worked immediately. Then I paired a phone. Phone calls worked right away but couldn't play music. Then I found an option to activate the music, but it didn't immediately work. However, after re-starting the car (Dension re-boot? Bluetooth re-connect?) streaming music over bluetooth began working. With these 3 core functions I was satisfied, so I organized the wires, cable-tied the Dension (so it wouldn't move) and re-installed the head-unit. The iPod can be selected in 2 ways. Control via the Dension GW unit or control through the iPod. While steering-wheel iPod controls would have been optimal, I found the Audi's instrument screen was too small and difficult to navigate. So, rather than storing the iPod in the glove-box, I ran the wire to the centre console (as seen in Enfig vid) and use iPod control. I have found that I need to manually connect the phone each time I start the car, while my other car pairs automatically. Perhaps this can be fixed with a firmware upgrade, which I have not done yet. Great product. Great delivery and support from Enfig. Can be installed with some moderate technical/mechanical skills.